I hope everyone had a good Easter! 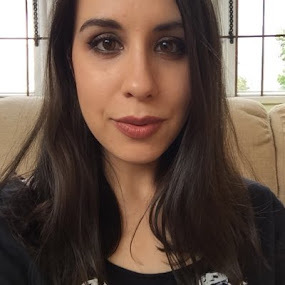 I've been catching up with a couple of my monthly beauty subscription boxes and wanted to share the contents of one of my faves from LoveLula. If you haven't heard of LoveLula before, they're a natural and organic online retailer who specialises in all aspects of green beauty shopping. 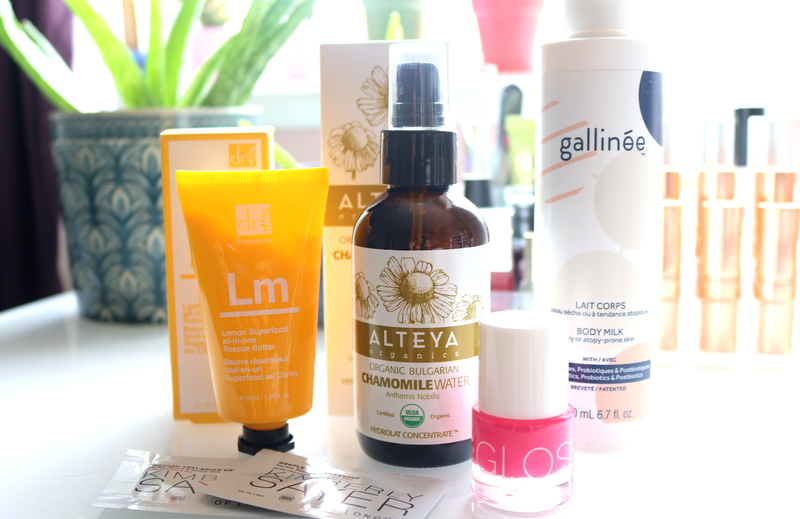 They offer a monthly beauty box subscription where all of the products fit in with their ethics, so everything is cruelty-free with no parabens and no SLS. Curious to find out more? 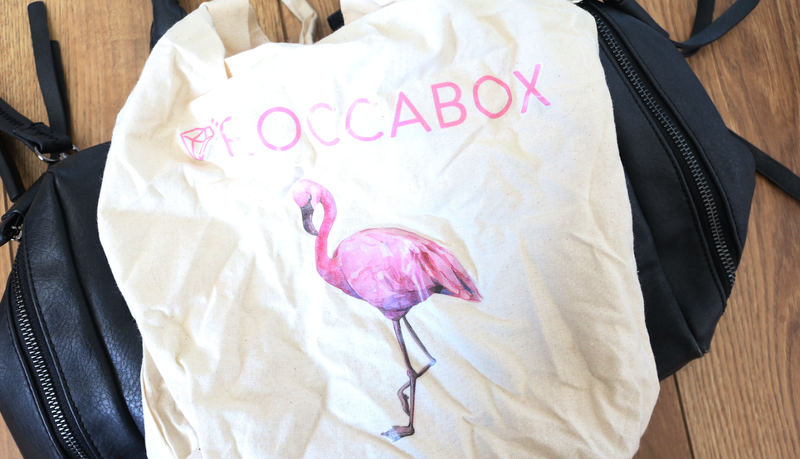 Here's what's inside this month's box! With the Summer holidays coming up, multi-purpose products are brilliant for popping into your travel bag and this bright yellow tube of moisturising goodness from Dr Botanicals is a must-have! The Lemon Superfood All-in-One Rescue Butter is a super-thick balm that can be applied to lips, elbows, heels, face, body - anywhere that is feeling very dry and in need of some hydrating TLC. A little goes a long way so this tube will last a good while. Packaged in an amber glass bottle, Alteya Organic's Bulgarian Chamomile Water is a beautiful product for the warmer months ahead and the perfect way to refresh and hydrate the skin. It helps to soothe, tone, revitalise and brighten your complexion with just a quick spritz and works well with Alteya's other skincare products, some of which I've reviewed in the past here. Worth £28 on its own, LoveLula have included another full-size product in this month's box with Gallinée's Body Milk - a 94% natural body moisturiser that's infused with probiotics to keep skin smooth, soft and supple for longer. I've used this in the past and loved it so I'm very happy to have another bottle in my skincare collection. The last main product is by Glossworks and this shade Raspberry Parade is from their brand new Spring collection. It boasts a 9-free formula which delivers a high shine glossy finish, and this juicy pink colour looks amazing on toes! To round off the box, there are also two samples from Kimberly Sayer to try; the Gentle Face Cleanser and the Restore Anti-Ageing Cream. LoveLula Beauty Box* is a monthly subscription box priced at £13.95 with free postage in the UK. Visit lovelula.com to find out more. Have you subscribed to LoveLula's Beauty Box? 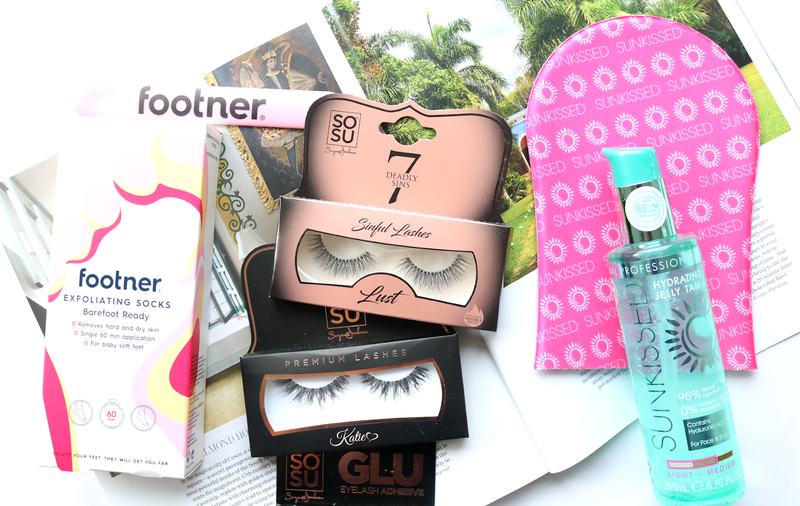 Get ready for Spring with these Bank Holiday Beauty Buys from Footner, SOSU Lashes and Sunkissed Tan! After months of hiding your feet away in socks and boots, it's time to take everything off and let your tootsies enjoy the warmer weather! 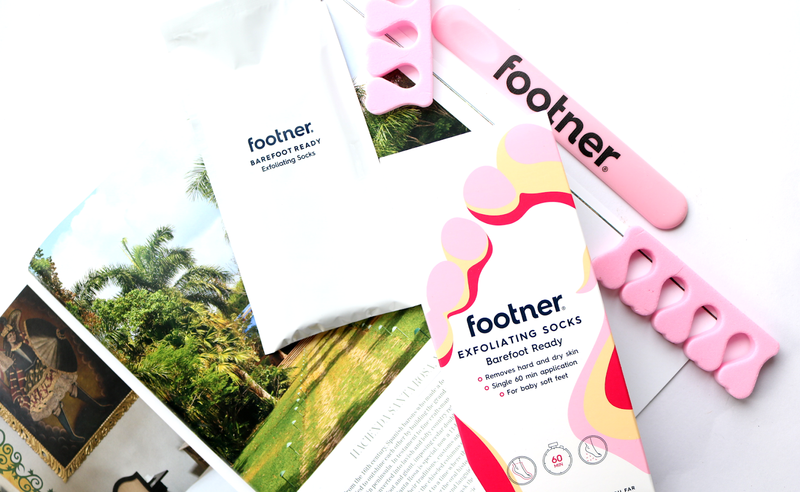 Being able to slip on a pair of sandals or flipflops is when Spring truly starts for me, and there's nothing easier to prep your feet with than a pair of exfoliating socks. Lots of different brands do these and I've recently been trying out a pair from Footner. I slipped on this pair from Footner onto clean feet and left them on for 60 minutes, after which I took them off and rinsed my feet with warm water to remove any residue. Immediately afterwards, my feet felt very soft and moisturised and then around 6/7 days later, I started to see the peeling stage happen (don't be tempted to pick or pull at this dead skin - just let it do its own thing naturally so that you don't cause any damage to the healthy skin underneath). After 10 days, all the dry, hard, dead skin had completely peeled off and I had beautiful baby soft feet, ready for my favourite pair of flipflops! N.B: These are single use but you only need to use a pair once every three months so they're a nice, luxury pampering treat for your feet. Bank holidays are a great time to meet up with friends and family, and if you have any evenings or nights out planned, why not use the occasion to try out some new false lashes? SOSU very kindly sent me these two designs to play with and I've been impressed by their overall quality. For a full-on glam look, SOSU Premium Lashes in Katie* have a beautifully textured flutter with lots of wispy drama that's surprisingly very easy to wear. They're handmade and feel lightweight on, adding full definition and volume - I love them! 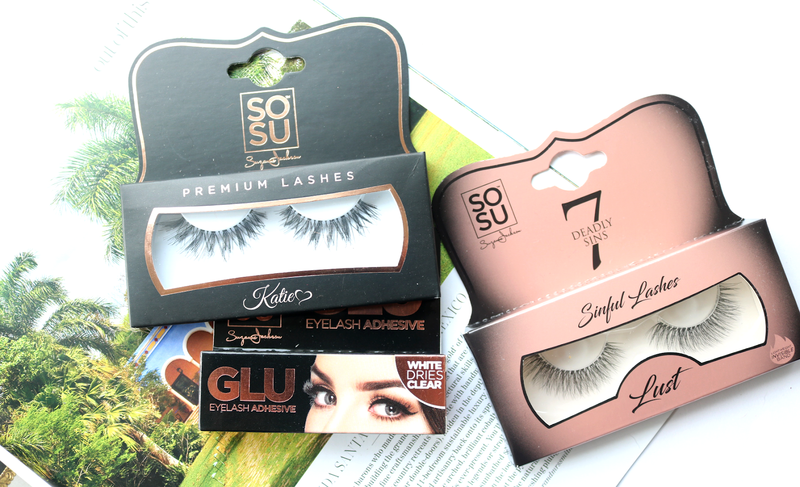 If you prefer something more natural looking instead, try the SOSU 7 Deadly Sins Sinful Lashes in Lust*. These synthetic, cruelty-free lashes are also handmade and are crafted from high-quality fibres that deliver a light and flexible finish for a gorgeous, fuller, longer and flirty look. Apply them with the SOSU GLU Eyelash Adhesive* which has a latex-free and waterproof formula, and you're good to go. 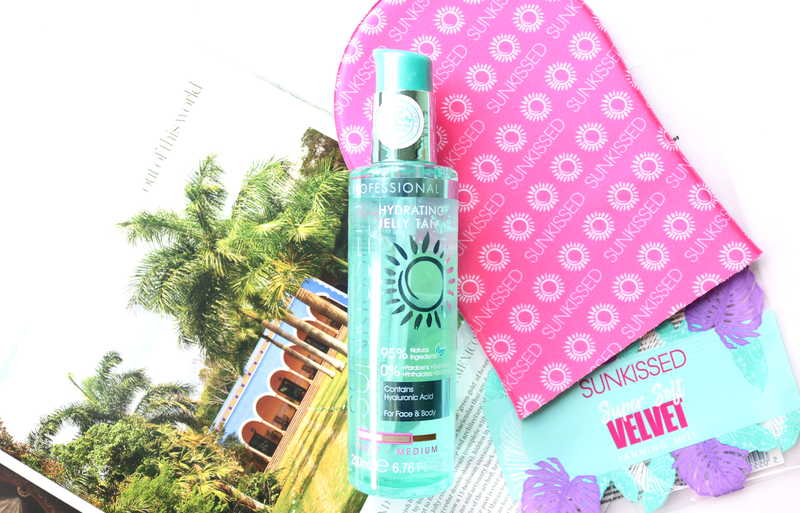 I always get excited when I come across a brand new self-tanning product and this one from Sunkissed arrived on my doorstep last month. Their Professional Hydrating Jelly Tan has a really interesting 'jelly' type texture, yet it's made from over 95% natural ingredients, is vegan-friendly, cruelty-free and free from parabens, sulphates, phthalates, silicones and alcohol. The bottle itself is partly made with recycled plastic and features a 'Bio Pe' label which is derived from sugar cane - how cool is that?! The tan has a handy pump applicator which makes the jelly-like formula easy to dispense. Once applied, it soon transforms into a light gel that quickly absorbs into the skin without any stickiness. There's a bit of a fake tan scent, but it's not overpowering or anything. I left it on overnight to develop for the strongest colour and was pleased to see a streak-free, lightly golden, very natural tan looking colour come through the next morning. Even better, my skin didn't feel dry as it contains Hyaluronic Acid to keep it moisturised - clever stuff indeed. 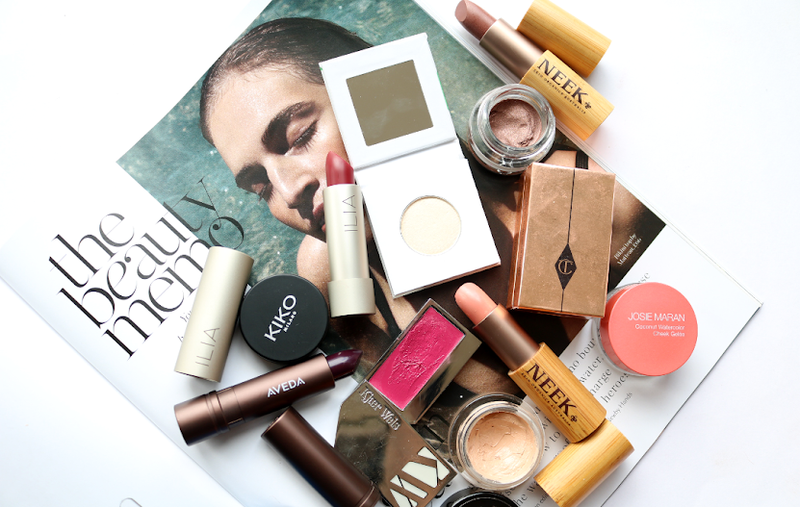 Will you be doing any beauty shopping this weekend? The long weekend is rapidly approaching, so now's a great time to treat your skin to a little mid-week pampering to get it in tip-top condition for the Easter festivities. My face masks of choice this week are both from Tropic Skincare for some serious Multi-Masking action! Spring is a really weird time for my skin as it's battling against a combination of sunnier, warmer weather, with cooler, blustery winds and those chilly April showers. Add to that a sprinkling of breakouts that are triggered by my immune system going into overdrive as hayfever season hits, and it's safe to say that my skin has not been looking its best lately. Help is on hand though from these two pots of joy from Tropic Skincare, a British and vegan-friendly natural skincare brand that regular readers will know that I'm particularly fond of. 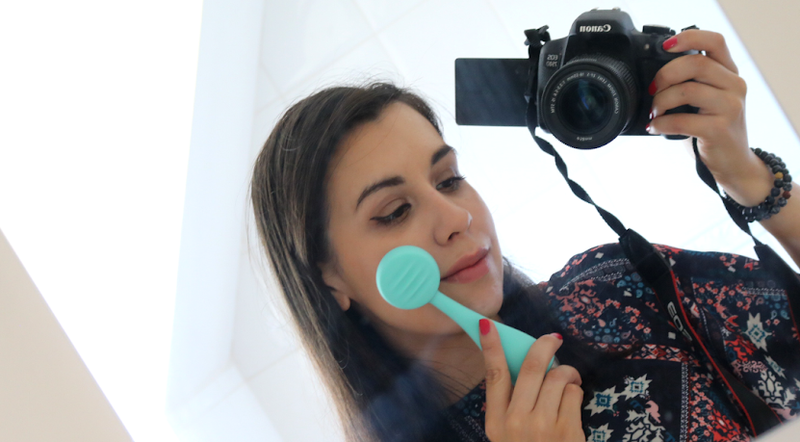 I've been putting two of their bestselling face masks through their paces, so keep on reading if you're curious to find out more about them! I do love it when a brand names a product so accurately because this mask is all about blitzing those zits and delivering a clearer complexion. Tropic's Clear Skin Blemish-Fighting Mask is a multi-award winner for a reason; it balances sebum production which is particularly useful if you suffer from an excessively oily T-zone like I often do; tightens pores; helps to reduce redness, and quickly says a fond farewell to any blemishes that may have set up shop on your face. 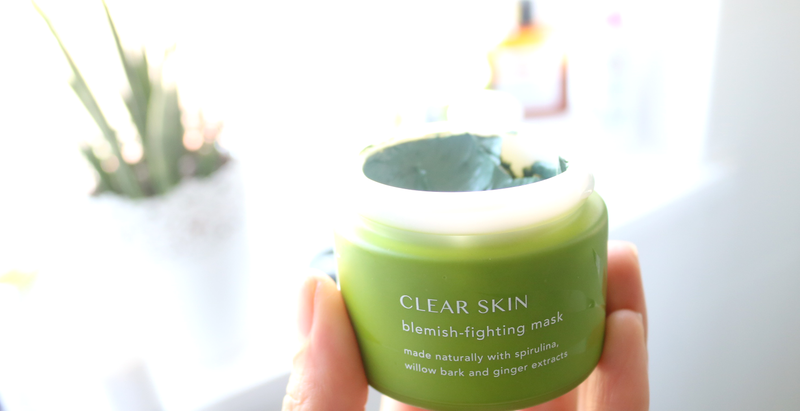 As you can see in the pot (and in my multi-masking selfie pic below), this mask is green in colour thanks to a blend of Green Clay and Spiriluna which help to draw out all of those stubborn impurities and blackheads. There's also Bamboo Charcoal, Goji Berry extract, Ginger, Cinnamon and Salicylic Acid included to refine pores and kill off any bacteria that are linked to causing breakouts in the first place. The texture is thick with a fresh herbal scent, and it's easy to apply with fingers or a spatula/mask brush. You can apply this mask to just your T-zone or dab it onto any stubborn individual blemishes, as well as using it all-over if you're particularly acne prone. Allow 10-20 minutes for it to work its magic before washing off, and voila, you should see a noticeable difference right away, especially on the T-zone. I could see that my pores looked much smaller and clearer, and any under-the-surface spots quickly rose to the top the next day which made it easier for me to deal with them. Use this treatment no more than twice a week as it's quite potent and although it didn't make my skin feel stripped afterwards, I'd still recommend following up with a hydrating mist and moisturiser or face oil, to keep your skin from drying out later on. 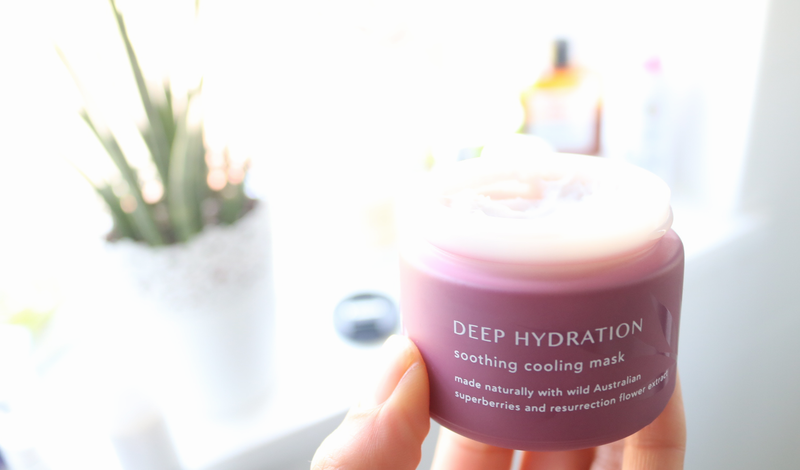 One that's excellent for all skin types to try but particularly well suited for very dry skin, is the Deep Hydration Soothing Cooling Mask, which as you might have already guessed, is brilliant for instantly hydrating and soothing the skin. Rich in antioxidants and natural anti-inflammatory ingredients such as Ressurection Flower, Allantoin and Wild Australian Superberries (Riberries, Muntries and Pepperberries), this super creamy-gel mask is a beautiful moisturising treat for the skin, especially if it's feeling dry, irritated or dehydrated. Texture-wise, it feels like a rich, thick and creamy moisturiser that you can leave on for 20-30 minutes (the perfect opportunity to enjoy a relaxing cuppa or catch up a short Netflix episode). It has a fresh, slightly berryish scent and feels wonderfully cooling - I can see myself reaching for this a lot over the next couple of months if we have a hot Summer, as it would be a fantastic post-sun treat for parched skin. Once rinsed off, my skin felt so much happier with a plumped up, thoroughly hydrated glow about it! 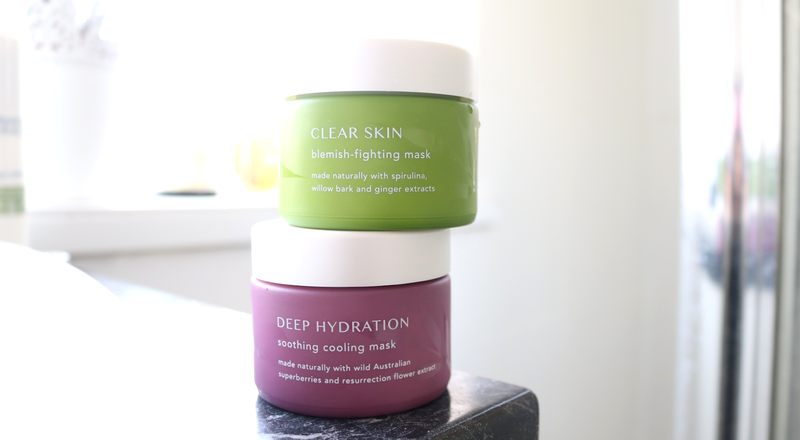 These two masks are great for multi-masking with if you have combination skin - simply apply the Clear Skin Mask to your T-zone and any blemishes, and then add the Deep Hydration Mask to the cheeks/outer drier areas/around the nose etc for a quick and easy facial! 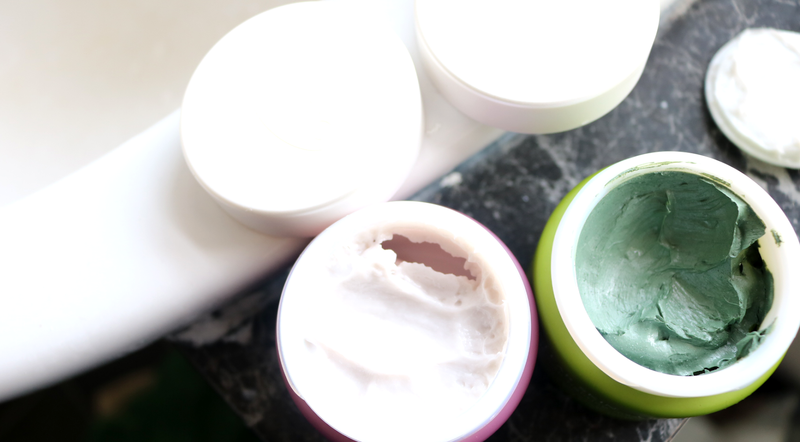 Are you a fan of multi-masking? 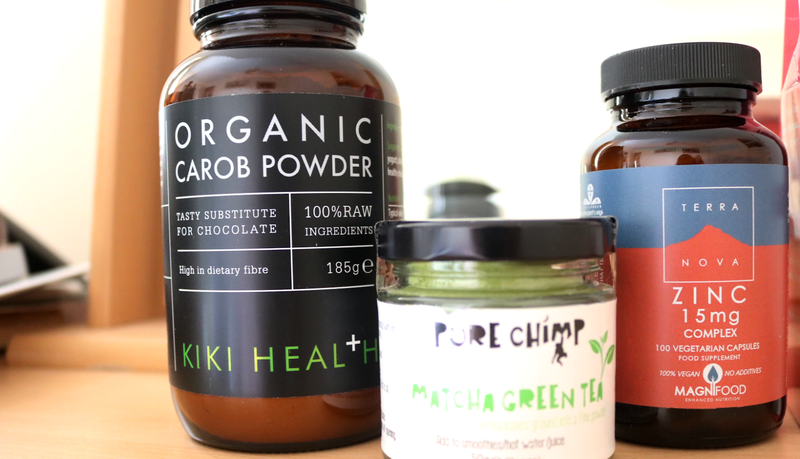 Many of you will be familiar with shopping online at LoveLula for natural and organic beauty, but did you know that they also stock a range of healthy food supplements too? 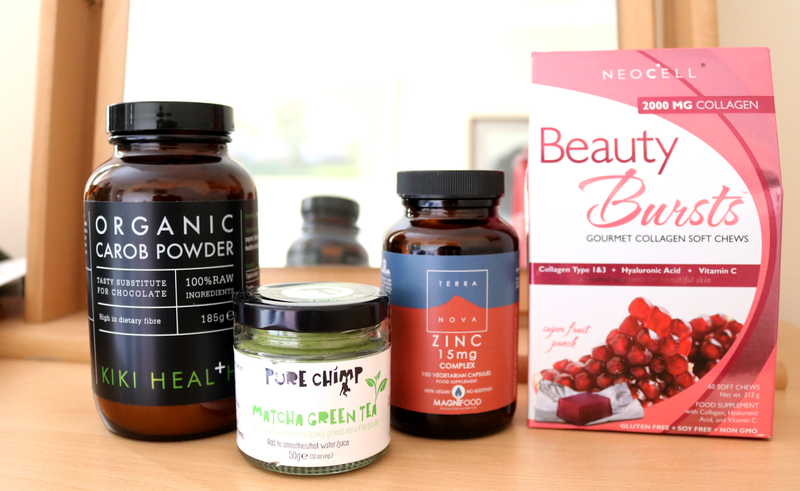 Here's my latest health haul from them featuring KIKI Health, PureChimp, Neocell and Terra Nova. If you're a healthy chocolate fan, you probably already have a jar of Carob Powder in your cupboard. Similar to Cacao, Carob Powder has a sweet, but milder chocolate-like flavour. It's derived from the Carob Tree where raw, unroasted beans are left to dry and ferment naturally in the tropical sun, before being ground down into a fine powder. This one from KIKI Health is 100% organic, high in dietary fibre and can be used in virtually the same way as Cacao. I like stirring a spoonful into porridge, sprinkling a little over Kefir or Skyr yoghurts, making hot chocolate, and it's brilliant in baking too as a substitute for cocoa powder if you want a chocolate flavour without the sugar! Matcha is something of an acquired taste, but if your tastebuds like it, a Matcha Latte is a great way to start your day. This now trendy healthy drink has been enjoyed in Japan for centuries and its benefits range from boosting the metabolism and improving your concentration, to clearing up minor skin problems and helping to keep blood sugar levels stable. Rich in antioxidants and essential vitamins and minerals such as Vitamin C, Zinc, Magnesium and Selenium, it's easy to see why Matcha is so popular. I've tried various different brands and have found that no two Matchas taste the same so it's often a case of trying a few and seeing which one you prefer. PureChimp is an excellent, high-quality ceremonial tea grade Matcha from Japan and they donate 5% of their profits to charity. It has a clean, very strong Green Tea flavour and can be easily whipped up into a Matcha Latte - check out my 'How To' here. You can bake with it as well! When shopping for food supplements such as vitamins and minerals, I always recommend buying from brands that don't use any 'rubbish' in their capsules, as a lot of the cheaper ones are full of unnecessary additives, fillers and bulking ingredients such as chalk. Terra Nova are a good one to look out for and I've purchased their products for years. They have a huge range available and something that I take as a supplement every day is their Zinc 15mg Complex. This vegan-friendly formula uses a Magnifood Complex for enhanced bioavailability and contains Rice Bran, Spirulina, Pumpkin Seed and Acai Berry. One a day is all you need so it's an affordable, high-quality supplement to pick up if you have a zinc deficiency. Looking for a beauty collagen supplement with a difference? 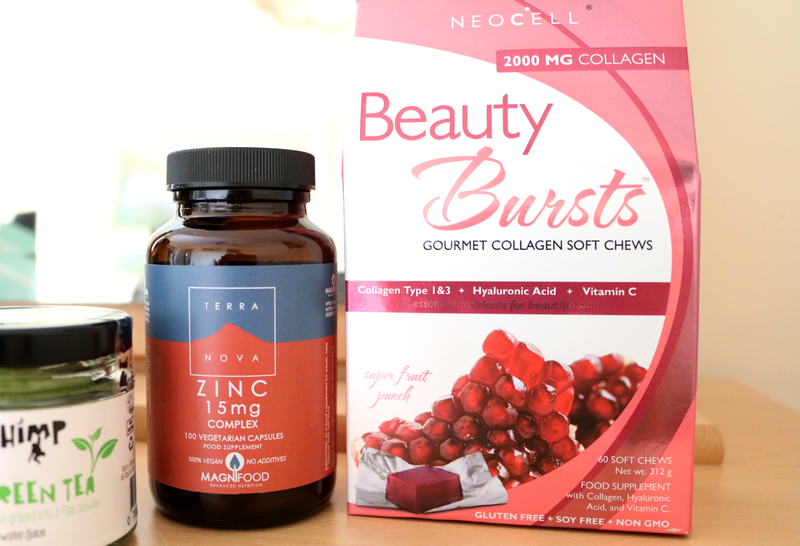 Try these Neocell Beauty Bursts which taste like fruity Chewits! They help to provide bioactive collagen peptides to the body, which, along with Vitamin C and Hyaluronic Acid, support the body's natural collagen production which declines as you get older. These are great if you're concerned about the visible first signs of ageing (such as fine lines, wrinkles and loss of elasticity in the skin), and they're free from GMOs, Gluten and Soy. Do you buy supplements for health and beauty? 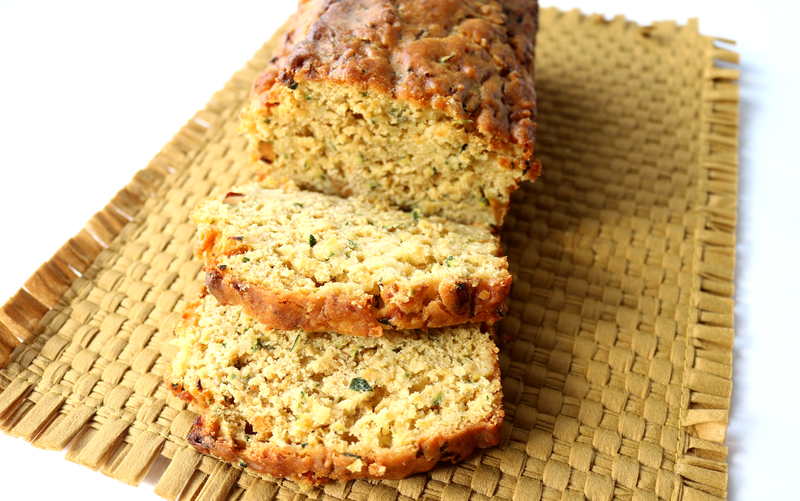 I know what you're thinking, courgettes in a cake? Say what?! It sounds bizarre at first, but they actually work really well at ensuring that you end up with a soft and moist cake. This is a lighter, slightly healthier take on the traditional Lemon Drizzle Cake with less sugar and fat, yet still packed full of flavour. When I was at high school, there used to be a little Tuck Shop on site that sold all manner of sweet and savoury treats, most of which were handmade by either the dinner ladies or the parents/grandparents of students. Fridays were known as 'Cake Days', and I always looked forward to seeing what was available as the menu changed every week. One of my favourites was Lemon Drizzle Cake and to this day, I still love the soft, sweet flavour with its tangy and often sickly glaze. I've been attempting to make a 'healthier' Lemon Drizzle Cake for a while now, but truthfully, the recipes that I tried just didn't hit the spot. Sometimes the only option is to just use less fat and sugar, rather than trying to omit them altogether, and after some tweaking here and there, I'm finally happy with the end result! 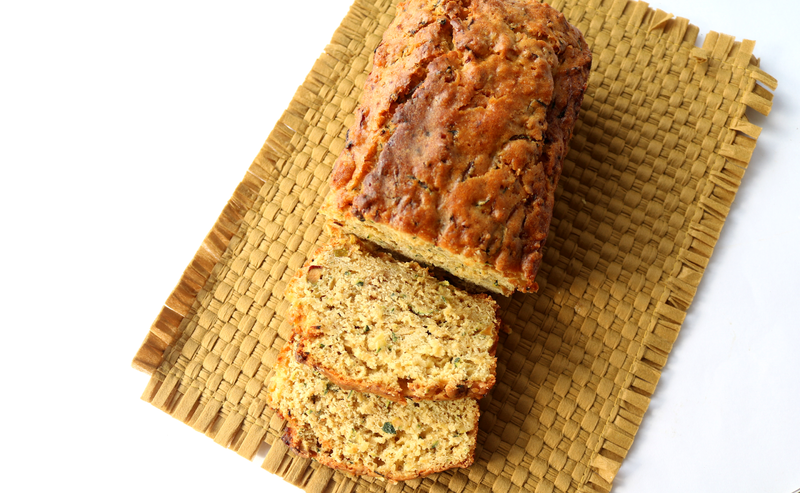 Oh, and for those who are wondering, you can't actually taste the courgettes in this cake - they simply add extra moisture and bulk (plus a little soluble fibre), which means that you don't need to use so much butter - win-win! Preheat the oven to 180C / Gas Mark 4 and lightly grease a loaf tin with a little oil, butter or use baking parchment paper. On a clean work surface, lay out a towel and finely grate the Courgettes onto it. Once done, carefully wrap up the towel and squeeze out as much moisture as possible over the sink to avoid a soggy cake. Melt the Butter in a saucepan and then transfer to a large mixing bowl. Add the Coconut Sugar, grated Courgettes, Lemon Zest, Vanilla Extract and Eggs and mix together until thoroughly combined. Next, gently fold in the sifted Self-Raising Flour, Baking Powder and a pinch of Salt, making sure that you don't overmix it as this can lead to a heavier/denser cake so use a light hand. Transfer the mixture to the loaf tin and bake for 1 hour, until a skewer inserted into the middle comes out clean. Allow to cool before adding the glaze if using. To make the glaze, simply mix the Coconut Sugar with the Lemon Juice in a small bowl and then carefully pour it over the cake. Wait at least 10 minutes to allow the glaze to 'infuse' the cake, then cut into slices and serve. Enjoy! Storage tip: Keep the cake in an airtight container for up to 3 days, though it's best eaten within 48 hours. 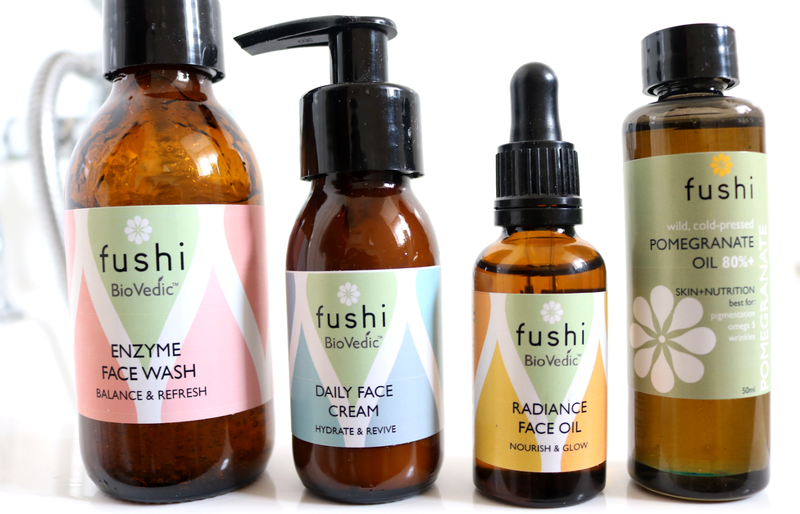 Launched last month, Fushi's new BioVedic skincare range has been helping my skin to transition to Spring with its formulas that are inspired by Ayurveda. 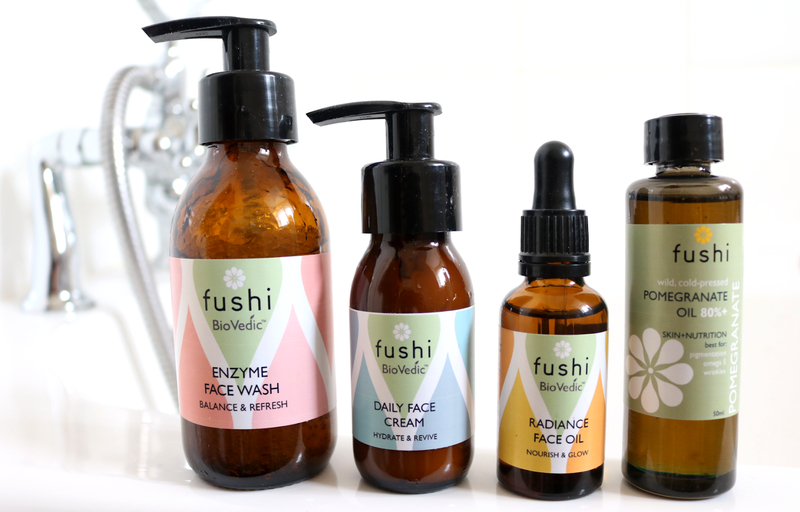 You may be more familiar with Fushi's organic food supplements (I reviewed their fantastic Aloe Vera Juice earlier in the year here), but the popular wellbeing brand also has a whole host of beauty products available and this brand new BioVedic skincare range are the latest additions. I have admired the ethics of Fushi for a long time. Their commitment to supporting Fair Trade means that the brand will only purchase from suppliers that do not exploit indigenous populations, and they are proud members of the Ethical Company Organisation and the Good Shopping Guide so you can buy their products with a clear conscious. I also love the brand's Ayurvedic roots which regular readers will know that I'm fascinated with, and it's great to see traditional Ayurvedic herbs being used in more skincare these days. The BioVedic skincare range features three effective products that make up a simple 3-step skincare routine which is based on formulas that contain the purest, freshly pressed oils and freshly ground herbs. There's a big emphasis on radiance and promoting a healthier, more glowy complexion so I'd recommend it for anyone who has dull skin in need of a boost. The glass packaging and colourful labelling give the products an eco-friendly contemporary feel that stands out on your bathroom shelves and having used them for about a month now, I know that you'll definitely want to try them out for yourselves! Step one is, of course, a facial wash and this Enzyme Face Wash is a wonderfully light and refreshing gel-based cleanser with exfoliating properties. Packed full of revitalising herbs and oils that include Vanshlochan Stem extract, Rice Bran Oil, Bamboo Powder, Aloe Vera, Rose Otto, Kalahari Melon Seed Oil and Coconut Oil, it utilises plant-based enzymes to provide a gentle exfoliation to the skin which helps to boost cell renewal, leaving it looking brighter and more radiant than before. I've been using this just twice a week to combat any dullness and it's been working a treat, plus I find that it's blended seamlessly into my skincare routine with my other regular products. If your skin is looking dull and feeling tired, the Radiance Face Cream is a brilliant product to try and offers a range of benefits including hydration, nourishment and overall brightening. Key ingredients include the revered Ayurvedic herb Manjisthta to promote long term radiance, Saffron to repair damaged skin, and Kalahari Melon Seed Oil which is rich in essential omegas to improve elasticity. This cream has a thicker than expected texture but once massaged in, it absorbs quickly, smells lovely and instantly hydrates the skin. I suspect that all skin types will like this, but do a patch test if yours is sensitive. There are a plethora of facial oils in my skincare stash but I feel this Radiance Face Oil is an excellent all-rounder for many reasons. It's a good one to pick up if you're new to face oils in general and want to start using one in your daily routine. Formulated with a blend of five key nutrient dense oils which boasts Raspberry Seed to protect, Kalahari Melon Seed for anti-ageing properties, Rich Bran to brighten, Moringa to provide nourishment and Linseed to reduce inflammation, this Face Oil is lightweight and easy to use morning or night. Simply use a few drops directly onto the skin as the last step in your evening routine, or add to your AM moisturiser for a real brightening boost. Last but not least, I wanted to include another new release from Fushi - their Pomegranate Oil 80%+. Pomegranate Oil contains Omega 5 (also known as Punicic Acid) which is a unique and beneficial fatty acid that's packed full of potent antioxidants, and Fushi's is considered to be the first Pomegranate Oil on the market that contains a guaranteed minimum content of 80%. Punicic Acid has a number of skin benefits and has been shown to be able to repair damaged skin, even out skin tone and pigmentation, and reduce the appearance of fine lines and wrinkles, so it's great for those who have dry, mature, sensitive and damaged skin. You can use it all over the face and body for softer, more toned and supple skin. This Pomegranate Oil is also food grade which means that you can take it internally so it doubles up as a useful food supplement. Drizzle a little over salads and soups, or blend into juices and smoothies to reap the heart-healthy, anti-inflammatory rewards thanks to high levels of Vitamin C, Linoleic Acid and Oleic Acid. The taste is somewhat acquired (kinda earthy and nutty) but the benefits are worth it! 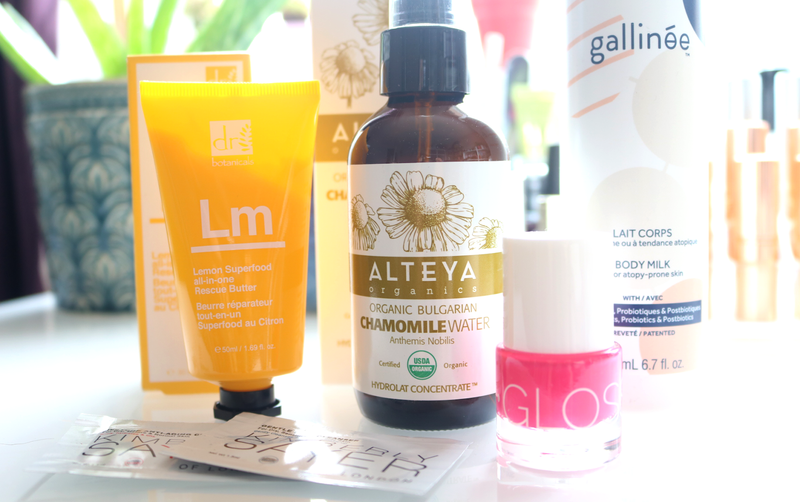 Do you use Ayurvedic skincare? Reducing your personal impact on the environment can seem like an overwhelming concept at first, but with a couple of clever swaps, you can help change your daily habits into a more sustainable way of living. Plus, you'll save money in the long run! 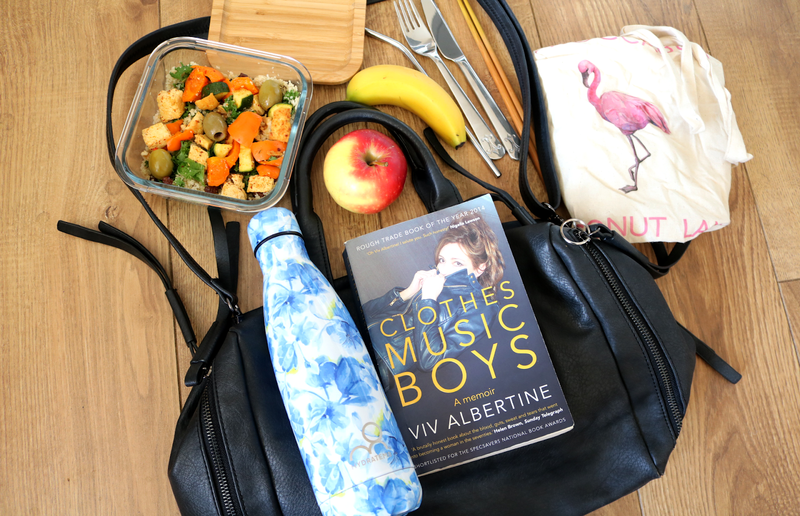 Do you buy a bottle of water or a soft drink to have with your lunch at college/Uni/work? Why not invest in a reusable bottle instead? Not only are you cutting down on your plastic waste, but it'll work out a lot cheaper in the long term. 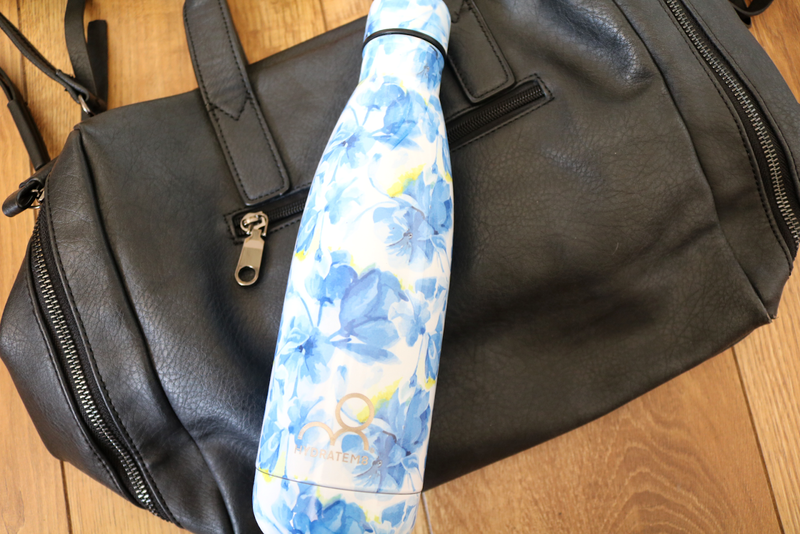 There are lots of different brands of reusable bottles to choose from and I've been enjoying carrying around my Hydratem8 Insulated Water Bottle* (£19.99, link) which comes in a range of colours and designs, including this gorgeous floral Sweet Pea print that's perfect for Spring! It has a 500ml capacity and is made from professional grade, thermal insulated stainless steel, so it'll keep drinks hot for up to 18 hours, or cold for up to 30 hours. It can be tempting to want to purchase your lunch out every day, but not only is this expensive, there's also all of that single-use packaging waste to deal with, most of which can't or doesn't get recycled. 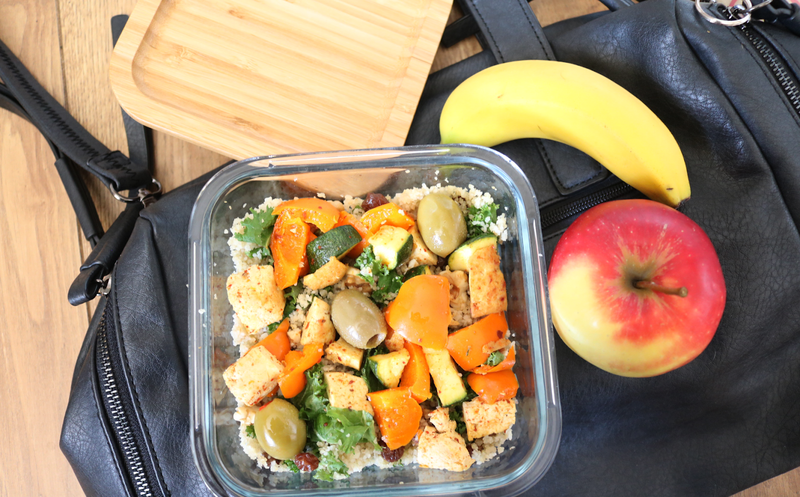 Prep your own lunches at home and save yourself around £25-30 a week - easy! With the money that you've saved, you can buy a reusable lunchbox instead that will last you for years to come. IKEA has some very affordable glass options (from £2, here) with different lids (the bamboo ones are great) that can also be used to heat food up in the oven, as well as storing food in the fridge and freezer. Don't forget your snacks too - ditch the plastic wrapped variety and pop an Apple or Banana into your bag instead for a healthy, zero waste option. Every day, millions of plastic straws and cutlery across the UK are thrown away after lunch is over and whilst the EU has recently voted to ban these items by 2021 in a bid to get rid of unnecessary single-use waste, it's unclear at this stage as to when a ban would come into force in the UK due whatever the hell happens with Brexit. 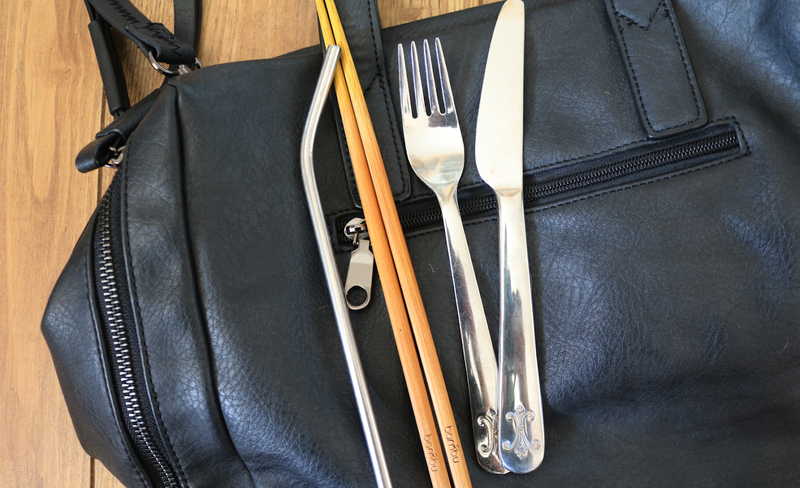 Get a head start by keeping a set of cutlery and a reusable straw in your bag. Bambu do a brilliant range of cutlery that's made from sustainable bamboo (my chopsticks, for example, are £1.50, link), and reusable stainless steel straws are popping up everywhere on the high street or you can purchase some online (EcoStrawz have a large range here). Most of us already do this, but I wanted to include it as a reminder as I see so many people on social media say that they've forgotten to bring their reusable bags with them when they've popped into town. Fold one or two up and tuck them into your handbag so that you've always got one with you and stick a few in your car door too for any impromptu trips to the supermarket. I've seen a lot of zero waste posts online lately that are heavily focused on reducing plastic waste, so I've decided to round off this particular post with something different. 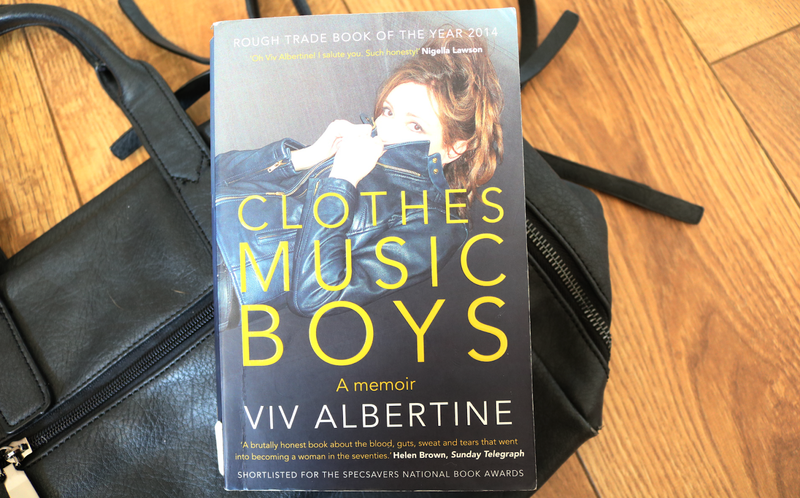 I'm an avid reader as many of you who follow me on Goodreads will know, and I've gotten back into the habit of using my local library to borrow books instead of buying them. The main reason was to save money at first and when I actually thought about how often I re-read a book, it just makes a lot of sense to borrow them instead. This way you also help to support your local community by keeping public services open, and it's better for the environment too. Do you already do all of these? What are your daily zero waste tips? Pop into Superdrug, Boots, Waitrose or Morrisons, and you're likely to come across a stand full of HASK products. The affordable cruelty-free haircare brand seems to be everywhere right now and with beauty gurus such as Caroline Hirons singing their praises, it was high time that I properly check out the brand for myself! 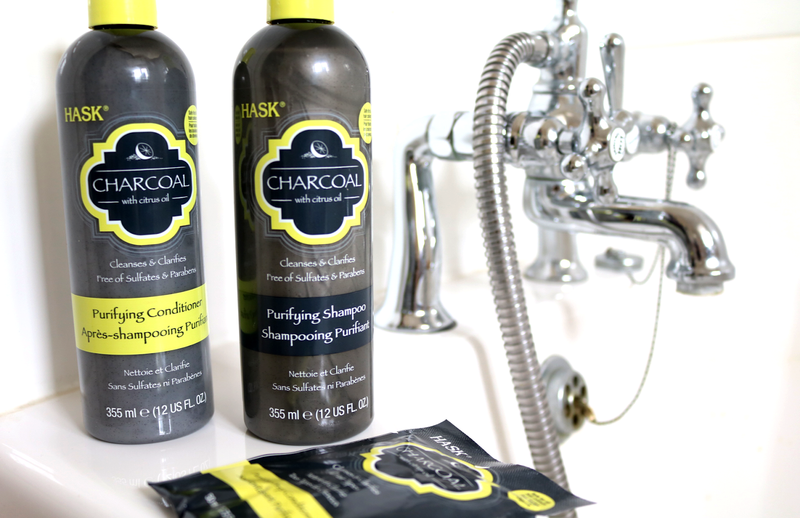 I've been trialling HASK's Charcoal Purifying range, alongside the popular Unwined Deep Conditioners to see what all the fuss is about. Last week, I mentioned the growing trend for anti-pollution skincare, but did you know that it's also catching on in haircare too? HASK's Purifying range features Charcoal, which is naturally derived from Coconut Shells, to get rid of impurities and build-up on your hair and scalp, leaving it thoroughly cleansed and swish-worthy. This shampoo (and the whole range) is also free from Sulphates, Parabens, Phthalates, Gluten, Alcohol and Artificial Colours which makes it suitable for all hair types to use, including coloured and damaged. It has a nice fresh scent thanks to Lemon and Grapefruit Oils, and don't be put off by the Charcoal content - it won't stain your hair! I like to use this just once a week to eliminate product and pollution build-up, but if you live or work in a city, you can use it as your everyday shampoo to prevent your hair from looking dull. To complement the shampoo, there's a matching Purifying Conditioner which shares the same scent and a similar formula featuring Charcoal, as the Shampoo. It's relatively thick and smoothes onto the hair easily, where it can be left on for up to two minutes as a regular conditioning treat (it's gentle enough for daily use too). I found that it doesn't weigh down my fine hair and leaves it instantly softer and more manageable. For the next level up in hair masks, the Purifying Deep Conditioner offers a super-moisturising and clarifying treatment that's ideal for all hair types. Perfect as a weekly or fortnightly dose of TLC for particularly worn out, damaged and parched tresses, this 10 minute hair treatment is sold in a 50ml sachet and you can easily get up to four uses out of it if you have fine hair like I do (thicker and longer hair will probably still get at least two uses!). A handy one to try if you're going away with just hand luggage. HASK have become well known for their Deep Conditioners and their latest range is inspired by popular wines and contains antioxidants derived from grapes (hence the clever pun on the name!). 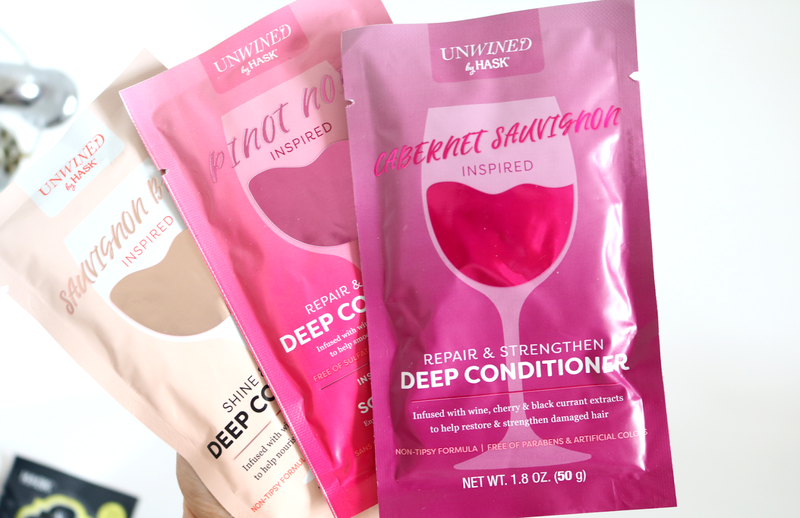 Unwined features four different products, each one bringing its own range of benefits to your hair, and I've been testing out three of them. The Cabernet Sauvignon and Pinot Noir Deep Conditioners are quite similar in my opinion; both are brilliant for helping to deeply nourish and hydrate dry and damaged hair, and they get to work quickly in just 5 minutes so are perfect for those who don't have much pampering time on their hands. My favourite of the three is the Sauvignon Blanc which is infused with Wine Extract, Resveratrol, Grape Seed Oil, Apple Extract and Watermelon Extract, and delivers a lovely glossy shine to lacklustre hair. Have you tried anything from HASK? It's been a rather rainy and chilly start to April which has led to me craving big, comforting bowls of food that I can wrap my hands around. 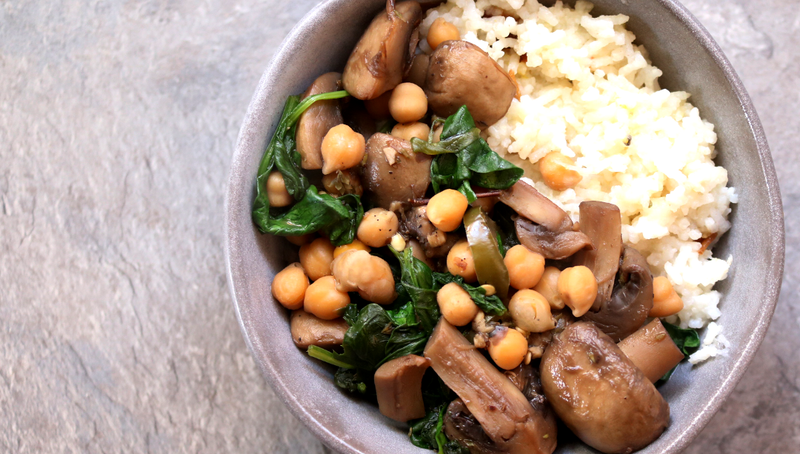 This easy one-pot Mushroom and Chickpea Ragout has been a standout winner this week, as it's packed full of nourishing veggies and plant-based protein to fill you up. Don't be intimidated by the term 'Ragoût', which basically just refers to a French-style stew; one that is much lighter and thinner in consistency than what we may think of as a traditional British stew. This hearty dish can be adapted in so many different ways to include a range of your favourite ingredients, or simply use it as a tasty way to use up any leftover veggies in the fridge - either way, I'm sure you'll enjoy the final result! 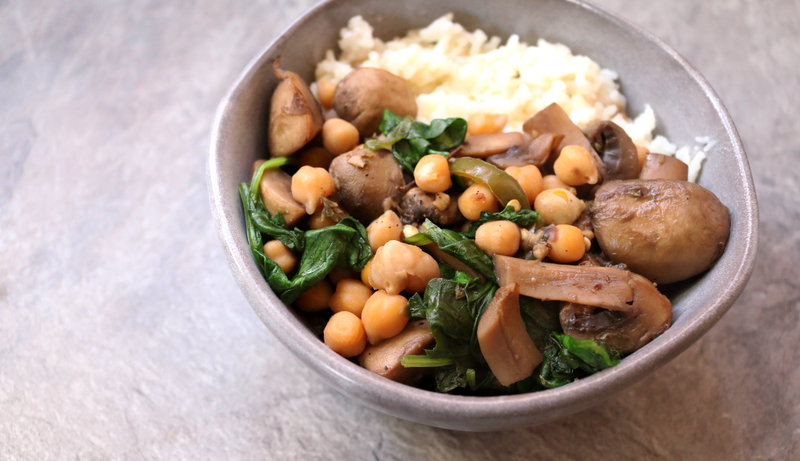 Below I've shared one of my go-to vegan ragout dishes for when I want something warming and filling, but more substantial than a bowl of soup. 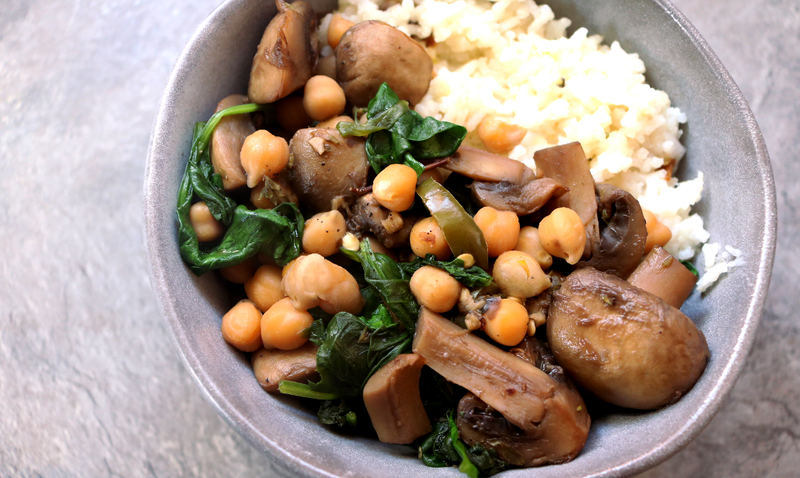 You can easily bulk this dish out further by including more veg, and it can be served with any kind of carb - I've chosen to include Basmati Rice here. 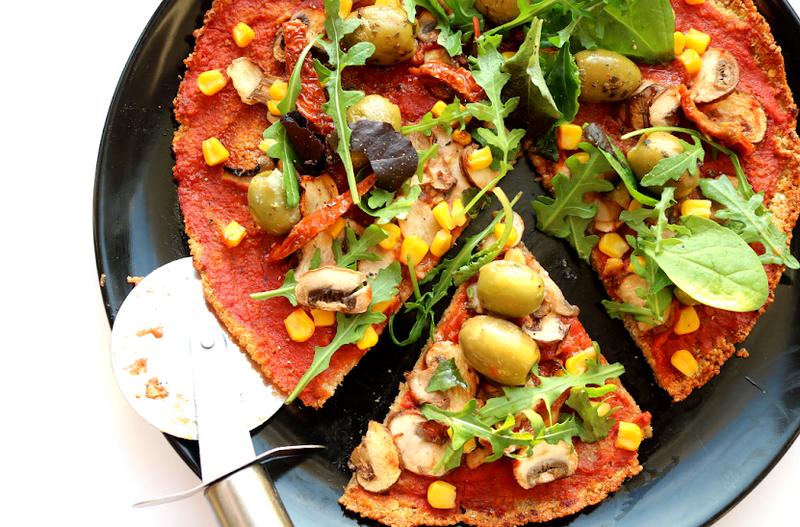 N.B: I've adapted this recipe from Naturally Nourished by Sarah Britton, a brilliant vegetarian cookbook. Melt the Coconut Oil in a large saucepan/pot over a medium heat and add the chopped Onion. Cook for 5 minutes until the Onion begins to caramelise, and then add the crushed Garlic and Mushrooms, cooking for a further 10 minutes until the Mushrooms have softened. Add the Chickpeas, Vegetable Stock, Rosemary, Thyme, Spinach, Green Chilli (if using) and a pinch of Salt & Pepper. Cover with a lid and simmer for 10 minutes. Remove from the heat and stir in the freshly squeezed Lemon Juice. 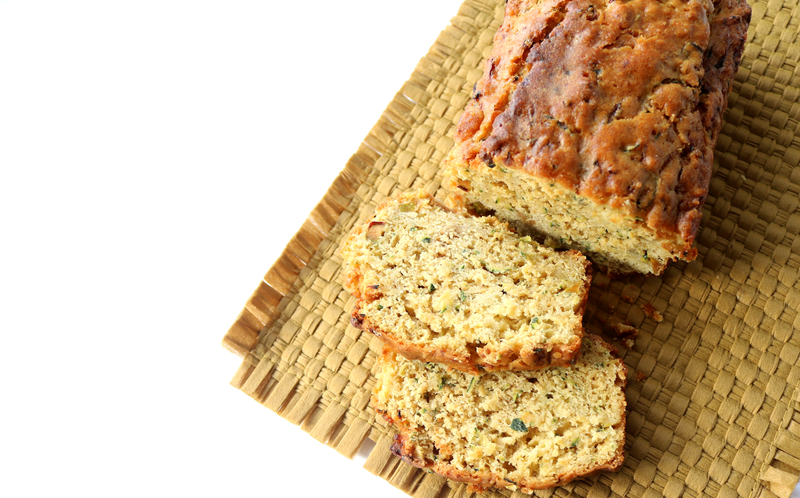 Serve immediately with your chosen carb and enjoy! Storage tip: Keep any leftovers in an airtight container in the fridge and reheat the next day for a quick and easy healthy meal. What have you been cooking this week? 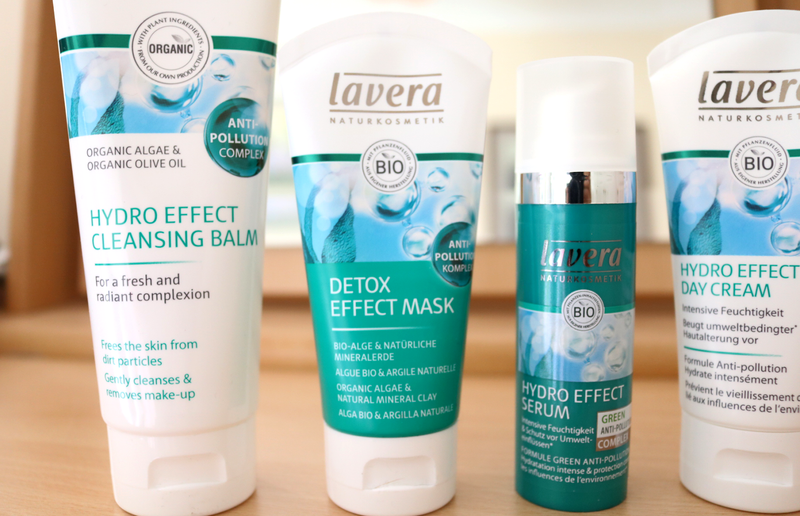 Skincare that offers anti-pollution benefits has been a big emerging trend for the past few years, so I was pleased to discover this new range from Lavera which I've been testing out recently. We all know about the negative impacts of pollution on our health and our environment, and more research is now bringing to the surface about how pollution accelerates the ageing process, which leads to cellular stress, dehydration and deeper wrinkles. 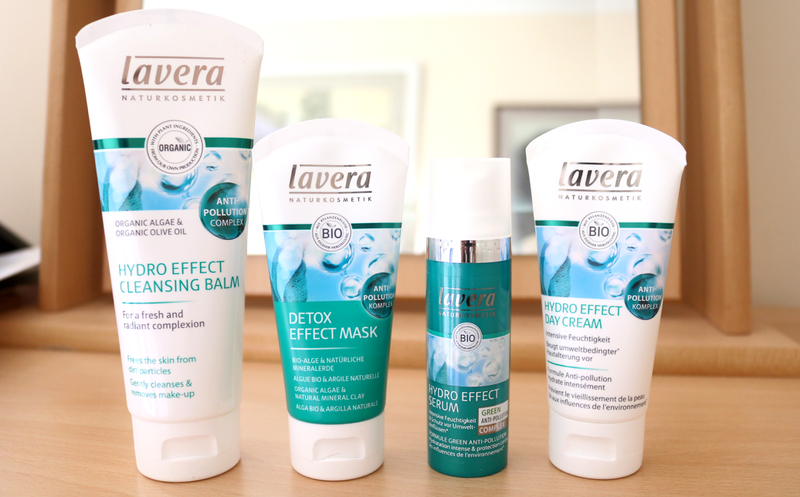 It's no surprise then to see the skincare industry bringing out specialist anti-pollution ranges to help combat the visible signs and Lavera's latest line called Hydro Effect is ideal for city dwellers and busy commuters alike. 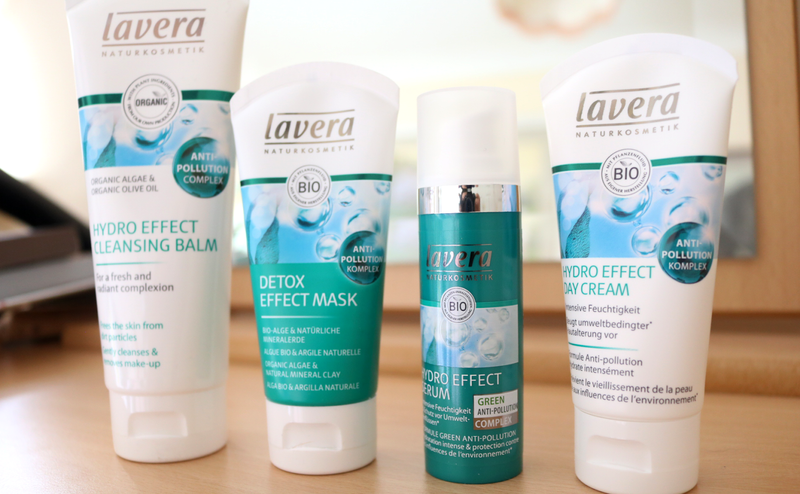 Comprising of four products, each one is formulated with Lavera's Anti-Pollution Complex which features Organic Algae extract and natural antioxidants that help to slow down pollution-induced skin ageing by strengthening the skin's barrier against the elements, countering the effects of free radicals and preventing further skin damage caused by environmental factors. Curious to find out more? I've tested out the full Hydro Effect range below. Cleansing is the first step in protecting your skin from pollution because if you don't properly remove all of those free radicals, dirt and particles of daily grime, they'll sit on the skin and begin to cause the ageing problems that I've discussed above, so never underestimate the benefits of a good quality cleanser! Lavera's Hydro Effect Cleansing Balm feels much more like a cream-meets-gel cleanser in consistency and texture, rather than a regular thick cleansing balm, and is quick and easy to massage into the skin. The gentle formula is kind to sensitive skin and it basically dissolves all traces of makeup, dirt and impurities in less than a minute. I like the subtle fresh scent and love how it leaves my skin feeling soft and thoroughly clean after every use. Suitable for all skin types and can be used both morning and night. 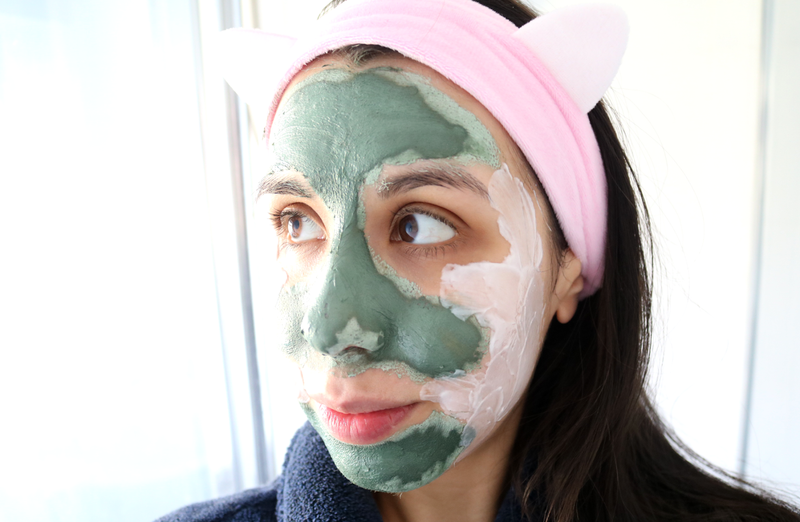 Once a week, I enjoy using a face mask as a pampering treat and this Detox Effect Mask has been my current go-to to draw out stubborn blackheads and other impurities, whilst it delivers a good exfoliation to remove dull, dead skin cells at the same time. This clay-based facial treatment also features ingredients such as Shea Butter, Olive Oil, Sweet Almond Oil, Jojoba Oil and Aloe Vera so that it doesn't leave the skin feeling stripped afterwards, though I would always recommend following it up with a moisturiser or face oil to lock moisture in as part of your skincare routine. Gets to work in just 10-15 minutes and is particularly beneficial for those who live and work in built-up, polluted cities/areas, as well as those who have oily, blemish-prone and combination skin types. One of the latest developments from Lavera, their Hydro Effect Serum is the perfect combination of hydration blended with anti-pollution benefits. A hard-working, organic and vegan-friendly serum that delivers noticeable results quickly, it contains Hyaluronic Acid, Vitamin E, Aloe Vera, Squalene, Mango Fruit extract, Peach Fruit extract and Shea Butter to moisturise and protect the skin's barrier so that it's better suited to win the fight against free radicals and environmental aggressors. It's quite a runny serum with a super lightweight texture that absorbs easily into the skin, and works well underneath any moisturiser or face oil. As with all serums, a little goes a long way so this bottle should last you a while! To complete the Hydro Effect range, there is a Day Cream that you can use as the last step in your morning skincare routine. Formulated for all skin types, this moisturiser features the likes of Organic Algae, Abyssinian Oil, Grapeseed Oil, Soybean Oil, Shea Butter, Jojoba Oil, Vitamin E and the Anti-Pollution Complex which helps to bind free radicals to prevent premature ageing. I liked the lightness of this day cream as it suits my combination skin perfectly and gives it just the right amount of hydration to keep it moisturised and protected against the elements all day long. Great for using underneath makeup too for a smooth base. Do you use anti-pollution skincare?